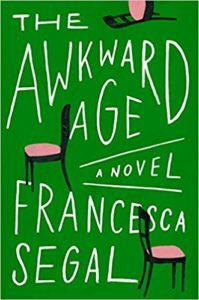 If you enjoy seeing families in distress under a microscope and watching them squirm, then you will enjoy The Awkward Age by Francesca Segal. The cast of characters: 46 year-old Julia, widowed and newly in love with James, a 50-something American OB/GYN; Julia’s sullen 16 year-old daughter Gwen, who is still grieving the loss of her father; and James’ 18 year-old son Nathan, who is about to graduate high school and go to a prestigious college to study medicine. Julia and James move in together in London, merging their families, while Gwen and Nathan hate each other… until they don’t. Gwen and Nathan’s relationship turns romantic, which is terribly awkward for Julia and James, at also puts them at odds for the first time in their relationship. And then, Gwen gets pregnant, which sends the whole difficult situation into overdrive. How will they, as a family, handle this mess? How can be it resolved in a way that doesn’t cause terrible pain? Are James and Julia ready to be grandparents – to the same baby? Francesca Segal relates her story with detail, compassion and that beautiful eloquence that so many British writers have. The Awkward Age is told mostly from Julia and Gwen’s perspectives, but there are additional characters with a stake in this family, and Segal lets us into their heads too. We see the action unfold from several perspectives, with much attention paid to their inner turmoil these characters are in. What I liked: the writing, the very plausible dialogue, the theme of the awkwardness of love at any age. What I didn’t like as much: how spoiled Nathan and Gwen were (it detracted from the plausibility of the story), the claustrophobia triggered by pages of dialogue (internal and spoken) among the same small family. Sometimes I just needed a break! Overall, I liked The Awkward Age and would recommend it to people who enjoy domestic drama. I listened to it on audio, and particularly liked Jayne Entwhistle’s precise, British pronunciation. Her American accents were a little off, but I got used to them quickly. She conveyed empathy for each character, even babyish Gwen – it never felt as if she was judging them or their circumstances – which I think was Segal’s point. Life can get awkward, and we just need to deal with it. Posted on July 20, 2017 by gayle. This entry was posted in Audiobooks, Fiction and tagged francesca segal, the awkward age. Bookmark the permalink.